Quotation marks (and quotation fingers) have a few different meanings. They demarcate the part of the speech which is attributed to someone else, they add emphasis and they sometimes show that the quoted section is wrong, euphemistic, imaginative, almost like a sarcasm mark. Like saying my blog is "popular". In the run up to Christmas I got a card from my cleaner. 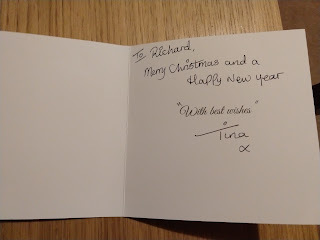 The inside of the card was printed with the message With Best Wishes. When she signed it she also added double quotes around With Best Wishes so it looked rather like she didn't really wish me the best. My friends and I laughed about it and added lots of sarcastic quotation marks to our own Christmas cards. The thing is that my cleaner quit last week. Maybe she hates me and she meant exactly what she wrote in my Christmas card.